Welcome to the Oregon Community Band. The band is a group of musicians of all ages and experience levels that gather for one purpose - to enjoy playing music. The band rehearses each Fall and Spring under the direction of Jim Baxter, to prepare for performances in malls, churches, senior centers, parks and more, throughout the Oregon area. 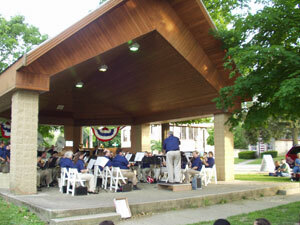 Come listen us during our annual summer concerts at the Waterman Triangle Park band shell in Oregon, WI. And if you've been looking for an excuse to dust off your instrument that's sitting in a closet, come join us for Tuesday rehearsals in the Fall and Spring. All are welcome! New: Concert #5 this Tuesday, July 3 at 7pm! Check the Events page for details.